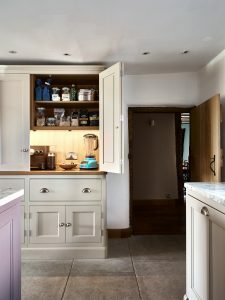 If asked to picture a quintessential country kitchen, it’s safe to assume that most of us imagine a scheme dominated by woods and neutral colour combinations. 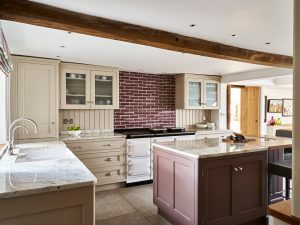 While the traditional idea of a country kitchen will always remain timeless and enchanting, now more than ever, country dwellers are choosing to introduce unexpected hues into their rural abodes with welcoming splashes of colour that truly uplift a space. While a fully saturated expanse can look incredible, the same energised effect can be achieved by adding even the subtlest touch of colour. 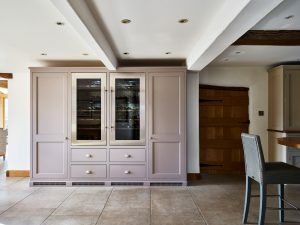 This bespoke kitchen is a fantastic example of a country home that has introduced very gorgeous and on-trend shades of purple to the island and tiled splash-back. 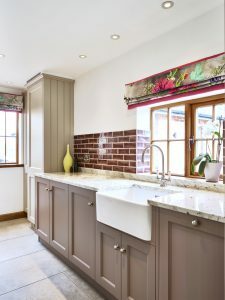 These colourful elements add a certain vibrancy to the delicate and mellow tones of the cabinetry, worktops and flooring for a scheme that reflect the owners personal style. 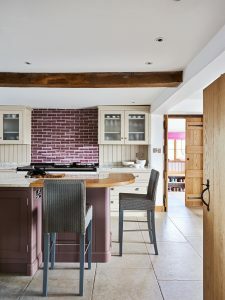 The same theme continues through to the boot room and utility space in this home, with the purple tones echoed in the cabinets, wall panelling and accessories. What is most wonderful about this style is how none of the traditional country charm has been lost, only enhanced by the use of colourful and unexpected accents. Here, colour and country marry beautifully to create a space bursting with originality and sophistication.